Silver Lake Township in Shawnee County, Kansas, used to stretch from the Kansas River to Jackson County--a full 11 miles. In 1918, county commissioners approved splitting Silver Lake Township. The southern portion, the southern 5 miles, was now going to be Silver Lake Township while the northern portion, the remaining 6 miles, was to become Grove Township. According to reports in newspapers in Rossville and Silver Lake, the split was due to road maintenance. There are no communities in Grove Township and what communities there were have long since disappeared. The earliest was Swinburn which was never in Grove Township but in Silver Lake Township. A post office operated from 1896 until 1901. It was never a town but had three livery stables, a blacksmith, and grocer. Swinburn, at least the post office, was located near present-day 78th and Hoch Road. In 1905, the town of Grove was established as a stop along the newly complete Union Pacific side track to Marysville in Marshall County, was completed. Grove was to be a major shipping area for the area which probably helped garner support for the township split. A township hall was constructed shortly after the split and at its peak in 1920, Grove consisted of a grocer, a depot, a grange, and a bank--the Grove State Bank--that only lasted three years. A small community still exists around Grove and the township has a brand new township hall that also houses a volunteer fire department. Grove was located along Tibbs Road between 66th and 70th Street. The last community was Doel, located a quarter mile of Grove, at present-day 70th and Tibbs Road. Doel shows up in a 1921 atlas but not much more is known about it. Neither Grove or Doel had post offices. Today, Grove Township is a quiet portion of Shawnee County. The nearest towns are Silver Lake to the south and Rossville to the west and Grove Township is the rare Shawnee County township that the suburban sprawl of Topeka doesn't reach. There are rolling hills and beautiful creek valleys making Grove Township one of the most natural and scenic areas of Shawnee County. The railroad tracks at 66th & Tibbs where Grove was located. The Soldier Creek Marsh Arch Bridge at 70th & Valencia. Built in 1922. The view of Soldier Creek from the bridge. A view of Grove Township from Docking Road south of 70th Street. 66th & Hoch with a sign that points the way to Grove Township Hall & Fire Station. Oh, God. Here it is. 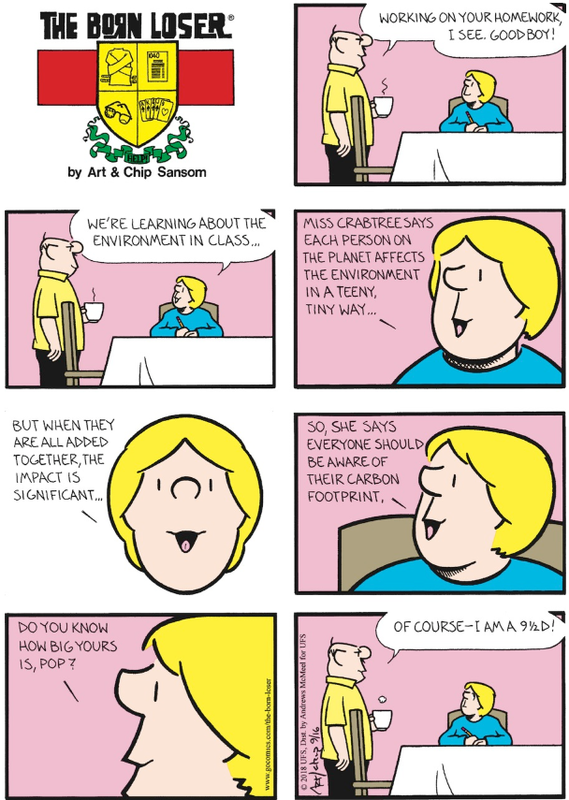 Yet another public education "teacher" indoctrinating our children about the lies of the environment and climate change. This is why they don't deserve higher wages. When they stop shoving their liberal agenda down our throats and start letting the kids pray again, then I'll be on their side! There. I just posted your complete troll diatribe so now you don't have to on the comments section of today's strip. FYI, my carbon footprints is between 13 and 15 depending on the shoe manufacturer.